Providers of Spanish Churros for the Food & Beverage industry in New Zealand. Churros, often referred to as a Spanish doughnut, are a tasty fried snacks. "Cook at Home Paella" are now offering a thin 12cm straight Churro. They are normally eaten for breakfast dipped in hot chocolate, but we find they can be eaten at any time of the day and work perfectly as a dessert. Churros are fried in olive oil until they become crunchy, and then are sprinkled with sugar. The surface of a churro is ridged due to having been piped from a churrera, a syringe with a star-shaped nozzle. We provide the Churros frozen so you can easily fry yourself as required as they cook from frozen and are generally served hot. If you are interested in purchasing Churros that you can easily cook at home then please contact us. 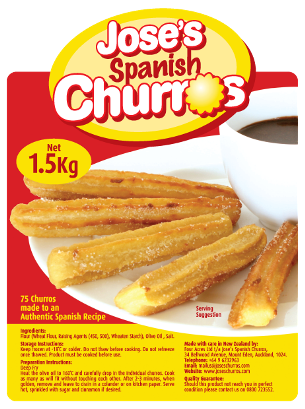 We supply 35 x 12cm Churros (straight) frozen for $17.39+GST ($20). This is exactly the same way you would buy Churros in Spanish Supermarkets.